A total of 7,959 young athletes from all over the country will compete at the first National Youth Games held in East China's Fujian province from Oct 18 to 27. Fuzhou, capital of Fujian, will stage more than 60 percent of the 305 events, while eight other cities and the Pingtan Comprehensive Pilot Zone, will also host events. This is the largest sports event that the province has hosted. 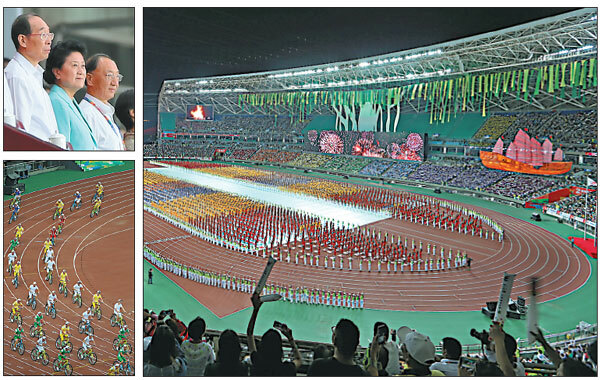 The opening ceremony was held at the Haixia Olympic Sports Center in Fuzhou on Sunday. You Quan, Party chief of Fujian province, said at the opening ceremony that with the support of the central government, the province has worked hard in the past four years to prepare for the event, in an efort to encourage more youngsters to develop the sporting spirit. 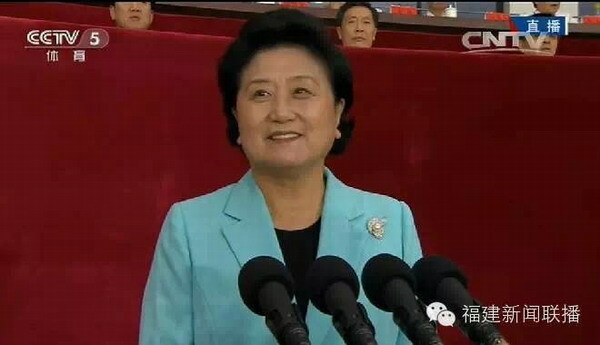 Minister of General Administration of Sports Liu Peng thanked everybody for their hard work in preparing for the games and Vice-Premier Liu Yandong announced the start of the Games. Xue Chen, beach volleyball world champion and a native of Fuzhou, had the honor of lighting the jasmine-shaped torch at the ceremony. 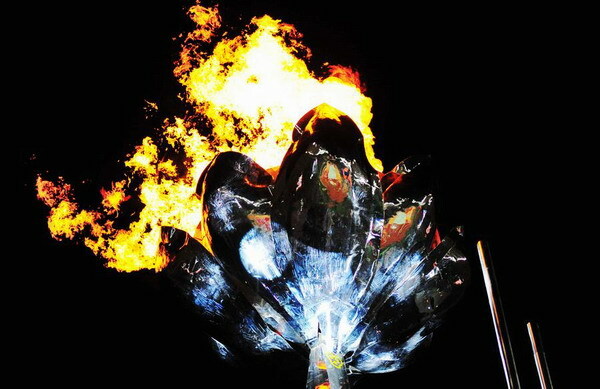 Jasmine, the city flower of Fuzhou, played a unique role at the opening ceremony and will throughout the games. To the rhythm of the Chinese folk song Jasmine Flower, a total of 1,200 female performers formed patterns representing the three rivers - the Minjiang, the Bailong and the Wulong - that converge at Fuzhou before flowing into the East China Sea. 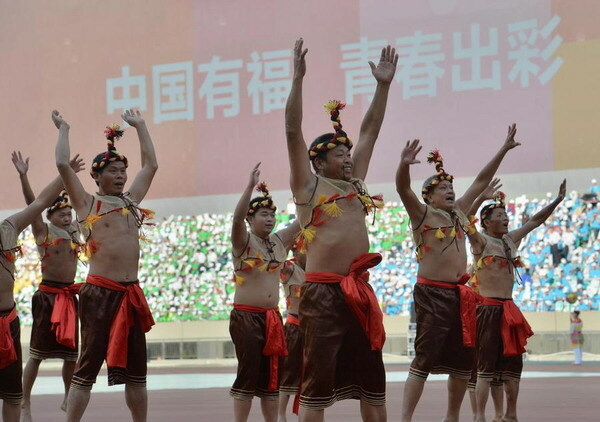 "The performance symbolized the areas the athletes come from," said Shi Zhenhua, operation director of the opening and closing ceremonies of the National Youth Games and president of the Fuzhou Song and Dance Theater. A total of 1.4 metric tons of jasmine flowers will be used during the 10-day event. The flowers will be made into corsages for the guests, wreaths for the medalists and necklaces for the delegation members. The flowers, which normally wither in August, were grown in greenhouses specially for the sporting showcase, according to an official with the Fuzhou Bureau of Gardening who declined to be named. "We learned a great deal about putting on an event like this from Nanjing (in Jiangsu province), which staged the Youth Olympic Games in August last year," said Gan Shiguang, director of resources development at the National Youth Games Organization Committee and an official with the Fujian provincial sports bureau. Like the Nanjing event, the National Youth Games will focus on educational and cultural exchanges as well as sports. "The gold medal obsession, which has prevailed in the country's State-run sports system, will be dampened at the event," Gan said. The event has not only given a facelift to Fuzhou's infrastructure, but it has also improved the overall quality of life for people in the city and boosted their well-being, officials and experts pointed out. "The Fuzhou government has renovated the city's shantytowns, upgraded its road network and built a number of sports venues as well as a range of streets for pedestrians and bicycles," said Yang Yimin, mayor of Fuzhou. "Moreover, the event has significantly boosted the development of the city's sports industry." All sports facilities at the venues will open to the public after the Games are over, according to the organizing committee of the event. Fuzhou hosted the China International Sporting Goods Show in May, which attracted nearly 120,000 visitors and more than 1,100 enterprises from China and overseas countries. Gan Mantang, a professor of sociology at Fuzhou University, said the Games has helped the city improve its infrastructure as well as promoting public fitness programs. More than 33,000 volunteers, including over 6,000 working at the sporting venues, are involved in staging the Games, according to the event's organizing committee.